Fair enough regarding not being able to fit any additions into the part count. I had trouble getting a bot into the middleweight class. As unwieldy as they may be, the tail of grenade lances looks pretty cool. Have you thought about relaxing the distance/proximity requirements for detonating the grenade? It looked like there were a few cases where the grenade passed close enough to do major damage without being detonated. It could be effective to deploy all the lances in a fan pattern when space allows to give it more chances to get one of them into range. Not including the Legacy and Unlimited bots, we now have 11 ACL bots! (14 including the Unlimited) Well done guys! Weighing in at 35 parts, RockSlide is a middleweight Plasma Shooter capable of tracking and engaging both ground based and aerial opponents. 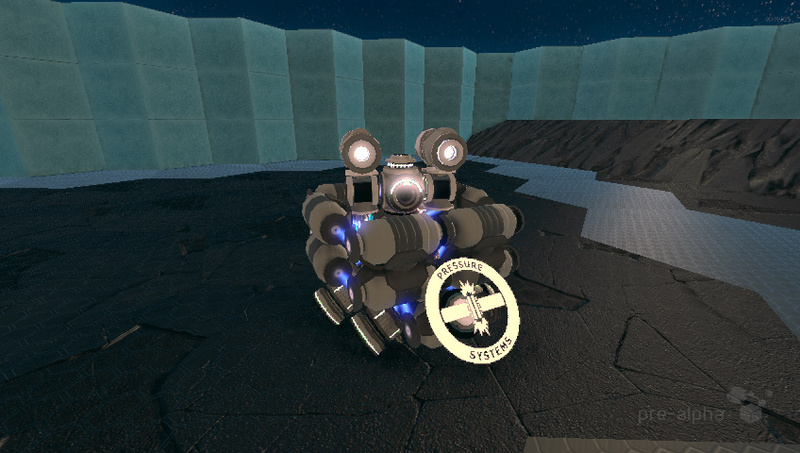 The turret on that one seem to work well, and the bot is a lot mare stable than it looks. It is a bit slower than most of the other bots, but that appears to be a good strategy in multi-bot matches as being late to the party means that it only has to deal with mopping up the survivors. Sumo/unarmed mode: bots with no conventional (damage causing) weapons try to flip each other or push their opponent out of the arena. Could possibly add some extra environmental hazards. Air/spacecraft: similar to the current ACL rules, but bots capable of full 3D flight are allowed. Roughly spherical arena defined by distance to a fixed centre point. Death race: bots try to navigate a track as fast as possible while fending off the competition. No/ limited damaging weapons. Sumo style ramming/flipping attacks encouraged. instead of partcount classes weight classes. If you use mass varying continuums you have to put a cap on their collective value and whatever cap value you chose is whats counted in the mass of your bot. Nonetheless with these rules small hyper dense turtle bots that stalls might reign, so maybe forbidding continuum mass over 1 would be the way to go... one things for sure unless rules are made to prevent this, all the bots will end up pancake shaped. Making bumpy terrain so that a compromise between low center of mass and offroad worthiness must be achieved might be the key? The problem is that the recipie of a good sumo bot is quite simple so this could get dull. The normal acl reward more diverse tactics. Also for the camera problems... maybe adding a 0.001 gravity would help? There ya go! Hit the nail on the head with that one! the very nature of rawbots is slow and tedious. Combat bots take days to make even for simple ones! In my opinion he reason making bots is so tedious is because of the sensors and programming is too limited, therefore needing to be quite clever to overcome the limitations. Kinda like how programming done on old hardware use a bunch of tricks to be able to fit in the very limited memory available. Naturally, sumo bots will need a few rules to prevent unstoppable forces and immovable objects. My main concern that it could easily turn into a less interesting version of the current ACL with the bots just ramming each other head-on until one of them rolls or gets pushed out of the arena. I had run a very basic test of a spherical combat zone under normal gravity just to see how hard it was to keep a plane in the intended region. Seeing the speeds that the test plane was operating at, it's likely that aerial combat wouldn't work as is would be nearly impossible to hit anything without equipping each bot with a massive amount of fire power. I dug out the old race track map, and my original bot still works as well as used to. There was one other entry, but I don't know which blueprint it is. This version of ACL should be a lot more feasible now that XFM is standard, as the previous bots were speed limited to prevent the wheels from coming off. The biggest problem I can predict at the moment is bots ignoring the race part and just ramming the opposition into submission at the first opportunity. the tighter the circle, the slower the bots are forced to move. battlebots style (non-sumo) real life combat had trouble with too many pushing type bots that were effective but boring to watch. I don't know whether you'd be able to make the arena small enough to keep speeds down without sacrificing the complex maneuvers that make aerial combat interesting. Regarding the difficulty of building combat bots, I think most of the people building entries have a couple of basic platforms and turrets that they use as a template to build a particular bots specialised parts around. I remember that racing bot. It looks like it's probably faster than the later versions of my racing bot that have extra downforce fins. It may be necessary to ban intentional flipping (or ban intentional contact entirely) as it would probably be difficult for flipped bots to know what direction they are meant to be driving around the track. I have a theory for aerial combat and how it could be done!